Decisions, decisions, decisions! Have you ever stopped to think about how many decisions you make on a daily basis? When to wake, what to wear, how to prioritize your day, what to eat, when to eat, when to leave the house in order to be on time for an appointment, etc. Sometimes the decisions are easy yet other times it takes great wisdom to make the right decision. As believers we often rely upon the Lord and seek His wisdom to make the right decision. The Bible has a great deal of advice on decision making and some Christians have written and said memorable things about decision making. 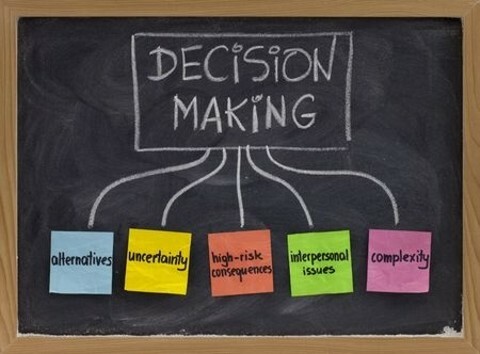 Take a look at my top 15 Christian quotes about decision making. Trust the Lord with your decision making. Decisions are sometimes quick and easy and other times very hard. Trust the Lord with your decision making. I pray that you were blessed with the Christian quotes about decision making. “If you have arrived at your decision with the sincere intention of pleasing the heart of God, incorporating biblical principles and wise counsel, you can proceed with confidence knowing that God will work out his purposes through your decision”. How succinct and well said. Too often we hear from those “seeking” the will of God for their lives when God’s will is unfolding in our midst. Unfortunately, a wondering takes place about God’s Will(GW) for our lives and the accompanying daily decisions we make, with often no clue of its(GW) present(not future) occurrence happening in our midst as we wonder. We are not so important that our decisions are going to thwart God’s Will from taking place in the world or in our lives. It(GW)is going to take place regardless of our decisions. The important point is that we are on His ship of salvation, having Christ as our Captain. His ways are perfect, unfolding before us, whether we list to port or starboard in our decision making. The ship is going to reach safe harbor. It is written in the log. Well said Doc, Thanks for your kind words and your thoughts on these great quotes. Blessings!